Visit two of Atlanta's most significant cultural establishments as well as a classic soul food restaurant on this small group tour in Atlanta. 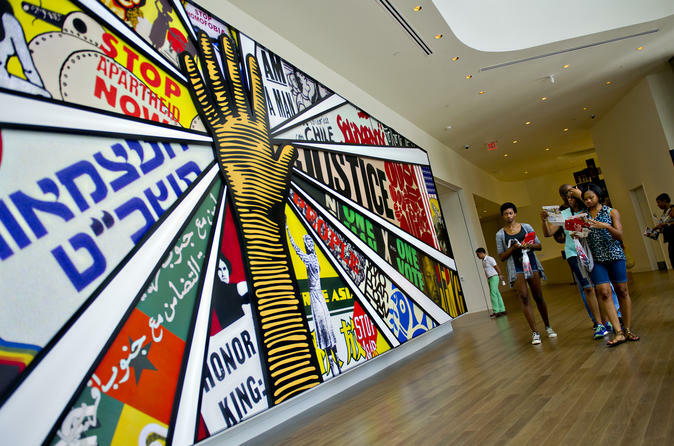 Explore The Center for Civil and Human Rights, enjoy lunch at Paschal's, and end your tour at the APEX Museum. Visit two of Atlanta's most significant centers celebrating historical cultural events, as well as a delicious soul food restaurant on this small group tour. Your day begins with hotel pickup and transportation to The Center for Civil and Human Rights, which serves as a bridge between America’s Civil Rights Movement and the today’s Global Human Rights Movements.The Center hosts a number of exhibitions, both permanent and temporary, that not only tell the history of the civil rights movement in the United States, but how that period is related to more contemporary human rights struggles around the world. Stop at Paschal's Restaurant or Busy Bees for an historic and soulful dining experience. Paschal's features soul food and southern specialities. Enjoy a mouthwatering lunch in what was once the 'meeting place' of some of the most notable entertainers, politicians, and business people, including Aretha Franklin, Dizzy Gillespie, Andrew Young, Maynard Jackson, Vice President Al Gore, and Dr. Martin Luther King, to name a few. After lunch, continue on to the APEX Museum, which presents history from an African American viewpoint and offers cultural insights into the African American experience. The Museum is located on historic Auburn Avenue, or “Sweet Auburn”, and works to help all American and International visitors better understand and appreciate the contributions of African Americans to the US and the world.